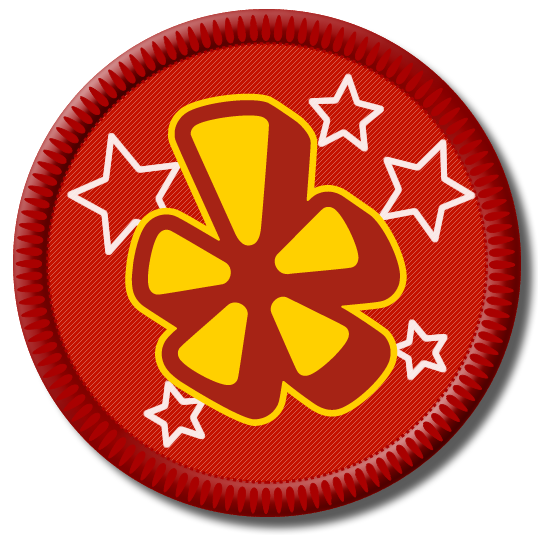 I have added Pad Thai Cafe to my coveted Top Ten List. How di I love thee? Let me count the ways. I love thee to the depth and breadth and height my taste buds can reach, when feeling out of sight For the ends of being and ideal grace. I love thee to the level of every day’s Most quiet need, by sun and candle-light. I love thee freely, as men strive for right. “What is Thai food? Every country in the world has its own food profile. It reflects its culture, environment, ingenuity and values. 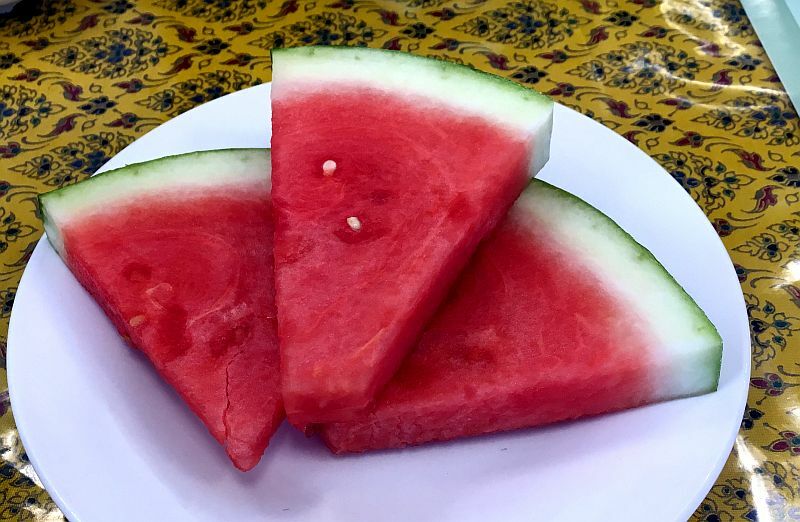 In the case of Thailand, these words come to mind: intricacy; attention to detail; texture; color; taste; and the use of ingredients with medicinal benefits, as well as good flavor. 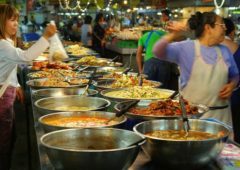 Thai cuisine is one of the most popular cuisines in the world. 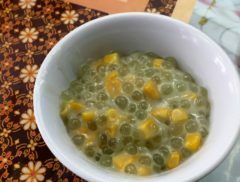 In 2011, seven of Thailand’s popular dishes appeared on the list of the “World’s 50 Most Delicious Foods (Readers’ Pick)”— a worldwide online poll of 35,000 people by CNN Travel. 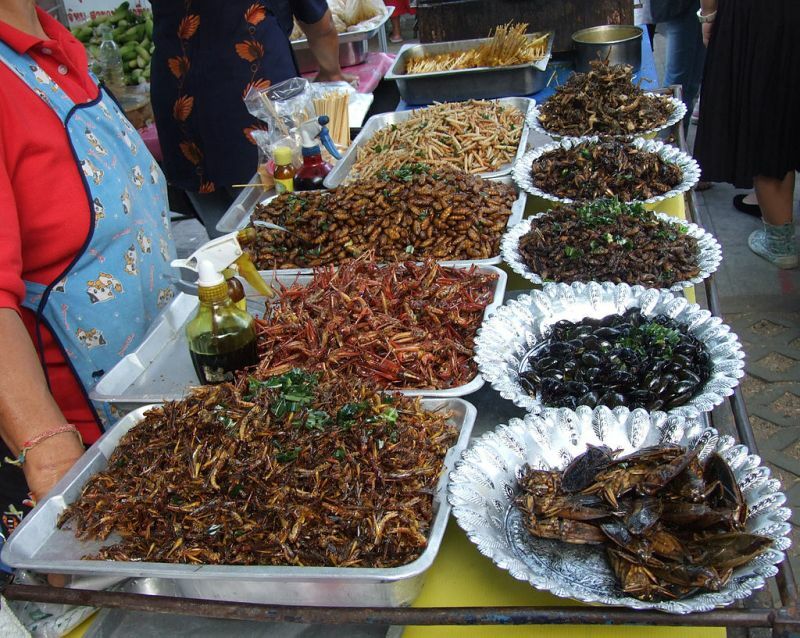 Thailand had more dishes on the list than any other country. They were: tom yam goong (4th), pad Thai (5th), som tam (6th), massaman curry (10th), green curry (19th), Thai fried rice (24th) and moo nam tok (36th). 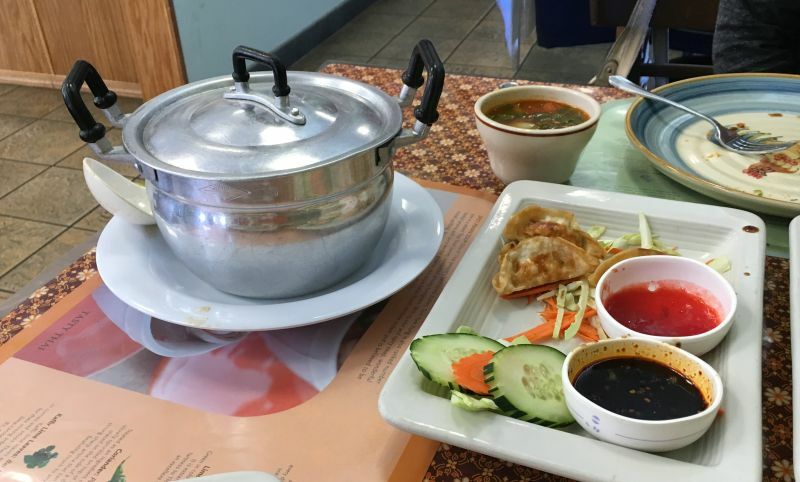 There are 19 restaurants in Albuquerque that serve Thai food. 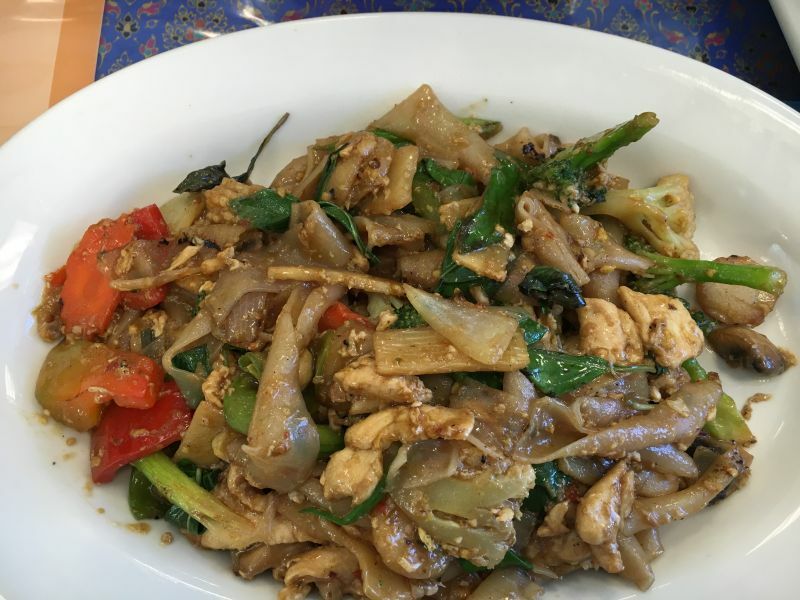 Pad Thai Cafe is my favorite, and a cut below you will find Siam Cafe and Thai Kitchen. These silver dollar-sized fish cakes are deep fried to perfection. 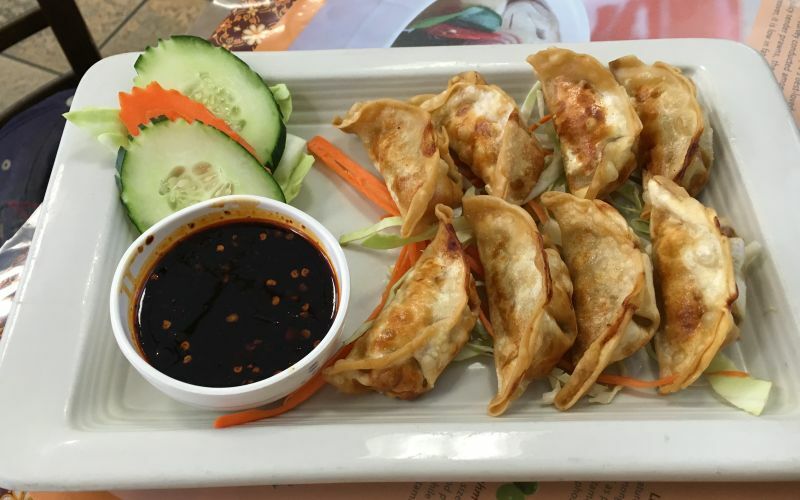 The tangy dipping sauce is out-of-this-world spicy. Incomparable. 8 pork potstickers, seasoned with pepper, garlic, and fish sauce. Served with sweet and sour sauce. Surely you have had pot stickers before in many types of restaurants. These are among the very best I have had anywhere. Never salty, but just plain delicious. 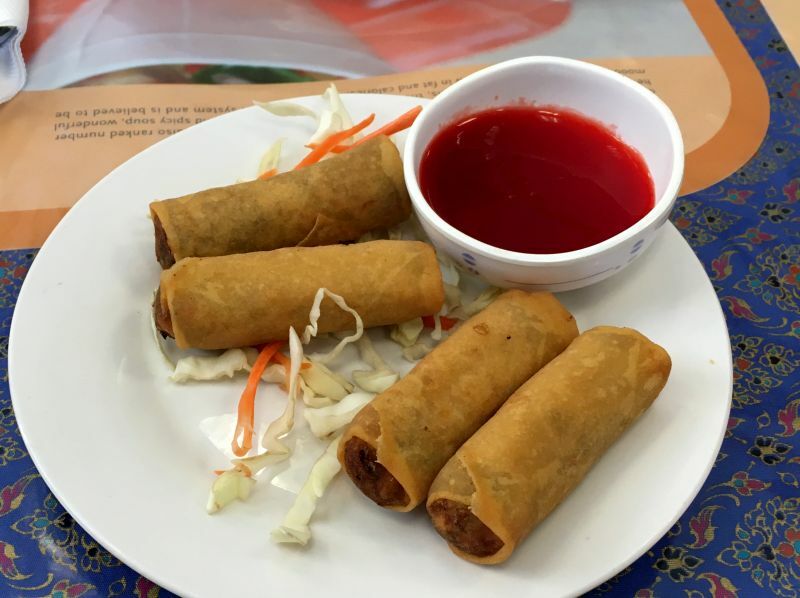 Smallish egg rolls explode onto your palate. Expertly fried. The dipping sauce is amazing. Warning: habit forming. You may crave these during the middle of the night. 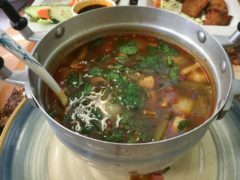 Spicy & Sour Chicken soup with lemon-grass, galangal, mushrooms, tomato, lime, cilantro, onion, chili, and fish sauce. I have eaten Tom Yum all over this country. The Dazzling Deanell agrees that this is the best we have ever had. The spicing is outrageously good. 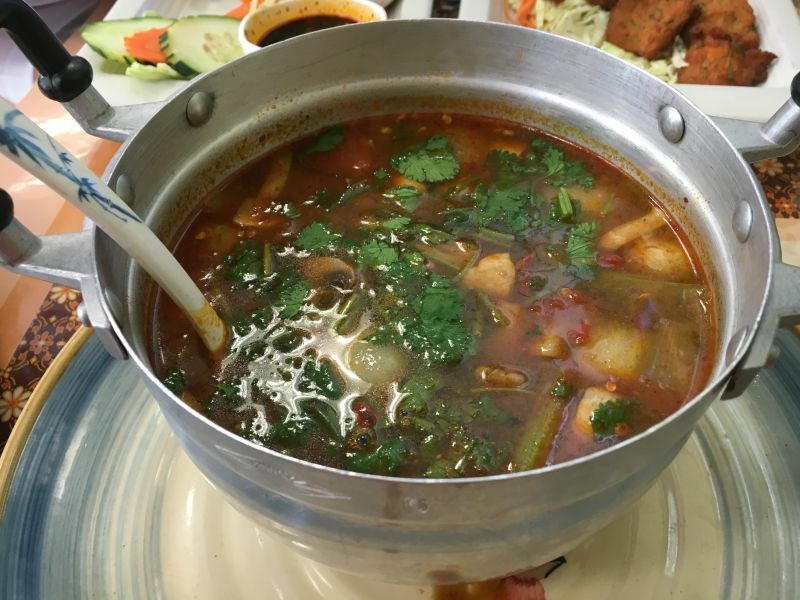 The lemongrass and chiles bathe your taste buds in a rich bath of complex flavors. Fabulous dish. Here is a sampling of what I had. There will be more. Lots more. 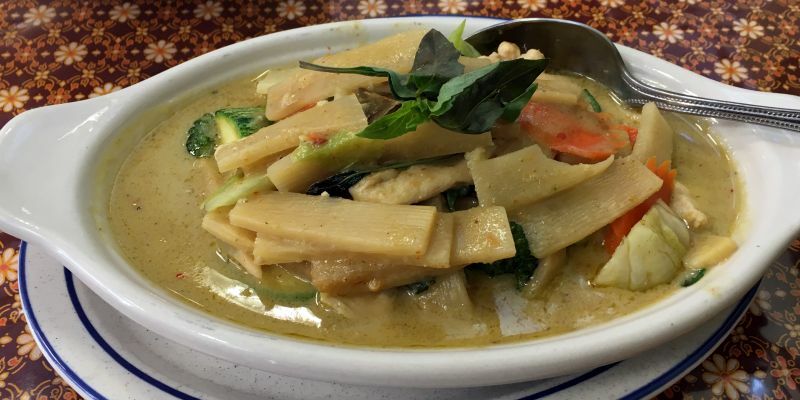 Thai curry refers to dishes in Thai cuisine that are made with various types of curry paste; the term can also refer to the pastes themselves. 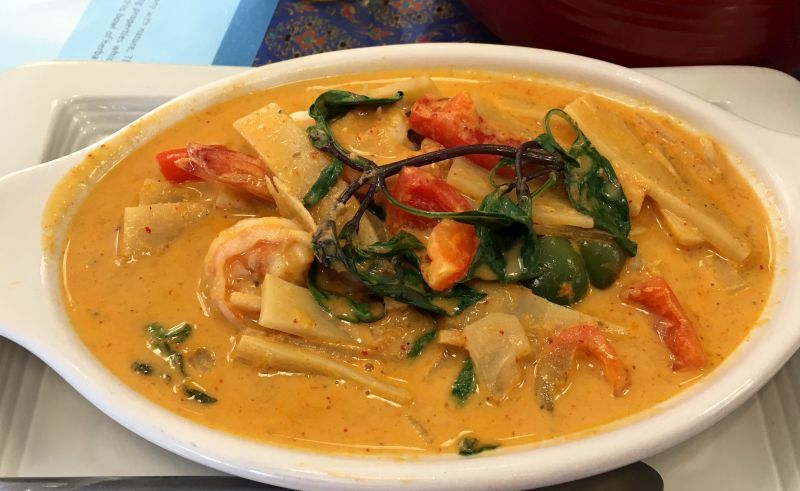 A Thai curry dish is made from curry paste, coconut milk or water, meat, seafood, vegetables or fruit, and herbs. 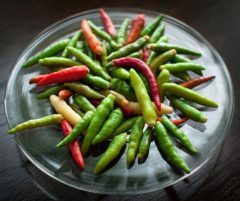 Curries in Thailand mainly differ from the curries in Indian cuisine in their use of fresh ingredients such as herbs and aromatic leaves over a mix of spices. The curries at Pad Thai Cafe are consistently the best I have ever had. The smoothness and mouthfeel are exquisite. The flavors explode onto your palate. The heat level can be anywhere you want, from mild to Thai hot (and more). Look at the image of Yellow Curry. I asked Noi to make this Thai hot. It was (see the flakes of red chile?). The heat does not mask the other spicing, a tribute to the excellence of this kitchen. You can add chicken, beef, shrimp, or fried catfish to any of these. My favorite is the Panang with catfish. Coconut Milk, curry paste, fish sauce, salt, sugar, basil, and red bell pepper. Coconut milk, curry paste, chicken stock, fish sauce, salt, sugar, roast peanuts, yellow onion, and potato. Catfish, coconut milk, panaeng curry paste, fish sauce, sugar, Kafir lime leaf. 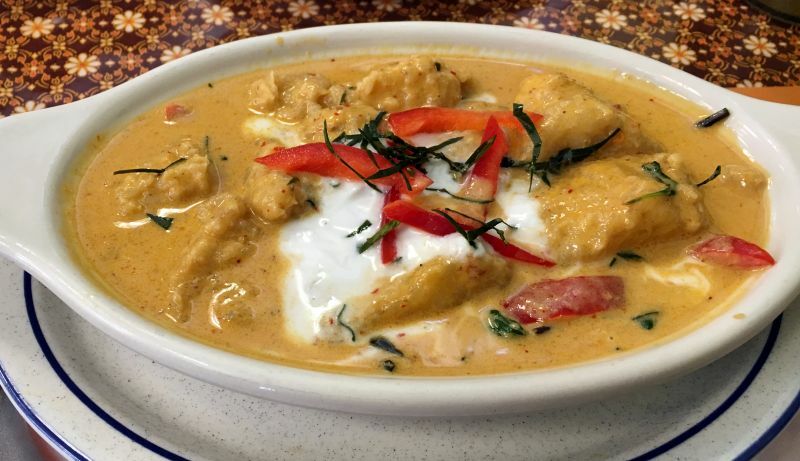 Panang curry with chicken represents the diversity of Thailand’s southern region. Panang refers to the island of Penang in Northern Malaysia bordering southern Thailand. Use 4 tablespoons curry paste from a fresh curry paste recipe or 5 tablespoons pre-made curry paste if time does not permit making your own paste. This delicious curry has become my top favorite, and has earned a coveted place on my Best Dishes of 2016 List. 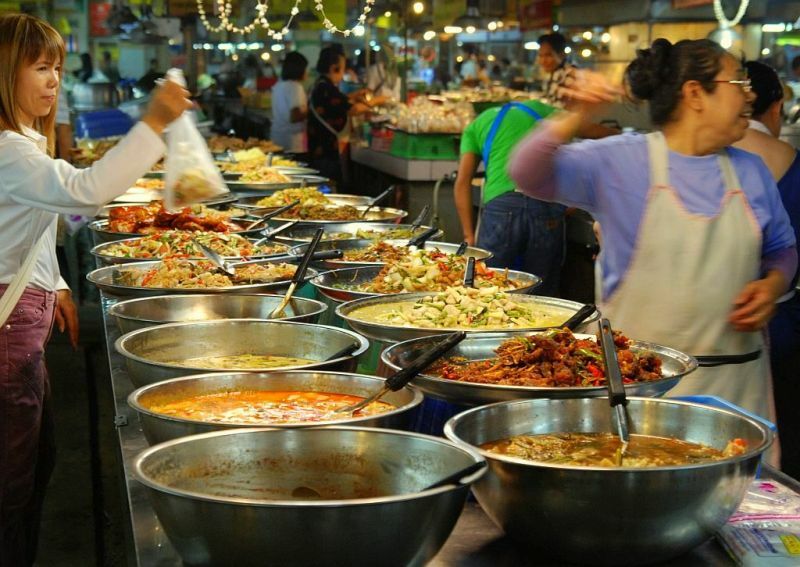 Most Americans know a handful of Thai noodle dishes, such as Pad Thai and Drunken Noodles. You need to break out of this rut and widen your sights. Check out this list of Thai noodle dishes. Add beef, chicken, pork , or shrimp. Stir fried medium size rice noodles (sen lek) with fish sauce, sugar, lime juice or tamarind pulp, ground peanuts, egg, bean sprouts, and Chinese chives (kuichai), combined with pork, chicken, seafood, or tofu. 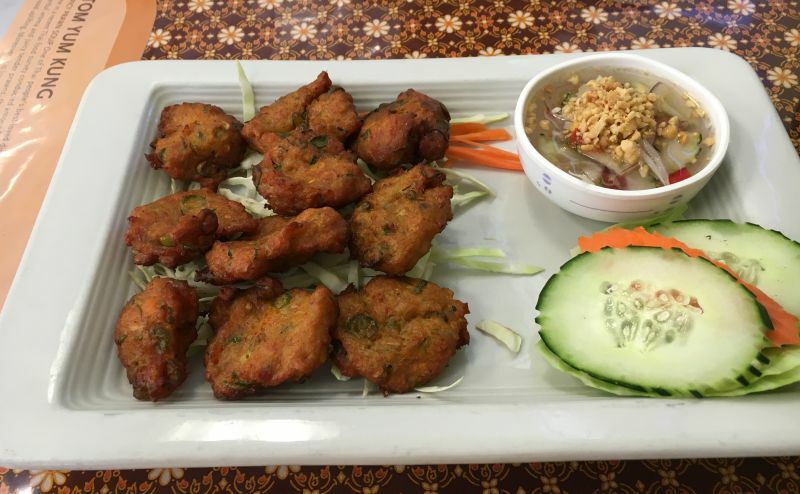 This famous dish has become the most popular dish in many American Thai restaurants. In all other Thai restaurants I have tried, this dish is much too sweet and boring, At Pad Thai Cafe, all of the elements are perfectly balanced. 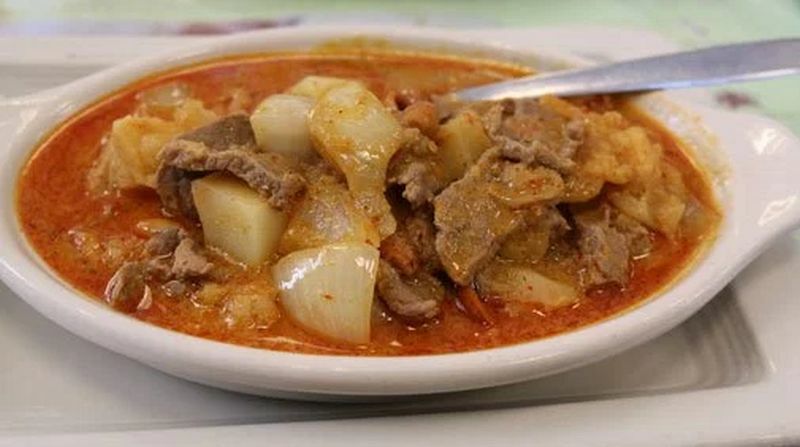 Order it spicy to Thai hot. A favorite of Ryan “Break the Chain” Scott. 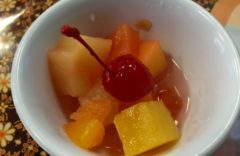 The Dazzling Deanell Collins could not stop raving about this fabulous dish. Aces for appearance, taste, and texture. You will not find a better version anywhere else in New Mexico. Three Scoops of Mango, Green Tea, and Coconut ice cream, topped with toasted almonds. When ordering a lunch special, a dessert-of-the-day will be included, such as one of the four pictured here. 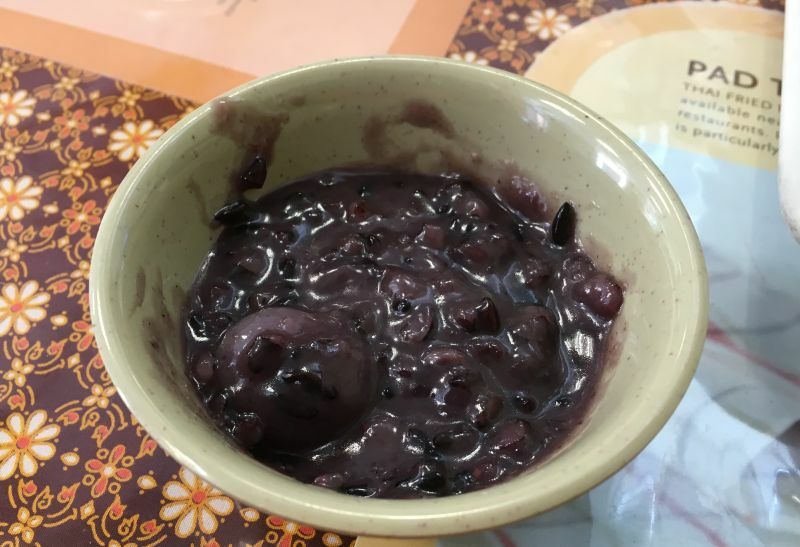 The sweet purple rice hes a thick, syrupy texture and is delicious. The tapioca and corn is to me the very best Thai dessert I have tasted. Not too sweet, but just right. If you are lucky, this will be the dessert of thr day, so jeep going back to see what comes up on your next visit. You probably have had the rest. Now you need to treat yourself with the best. Often. Anw when you are finished, go into the Talin Market right next door and stock up on the makings for creating these dishes right in your own kitchen. Don’t forget to pick up some fresh Bird Peppers. I cook with them all the time. HOT. 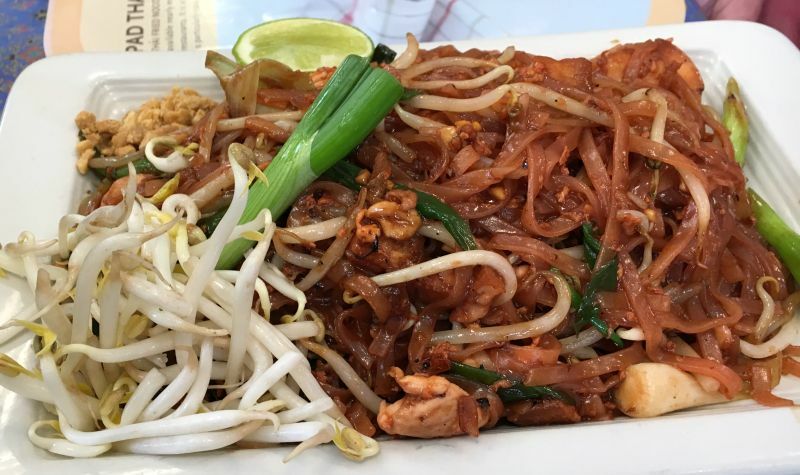 “When you discover a restaurant as amazing as the Pad Thai Cafe, you’ve got to share it with your friends. For the most part that means sharing my observations on this blog. Among my cherished readers are three of my very best friends, fellow foodies who’ll drop what they’re doing to join me for a meal to validate the veracity of the claims on my blog. 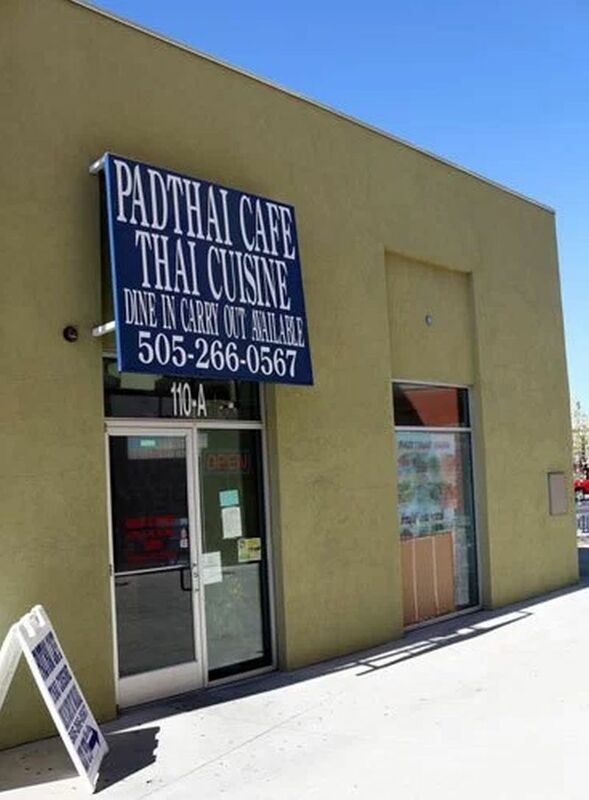 My second visit to the Pad Thai Cafe was with Ryan “Break the Chain” Scott: Larry McGoldrick, the professor with the perspicacious palate; and the Dazzling Deanell Collins. They were all surprised at the diversity, explosiveness and balance of flavors in every dish we enjoyed. 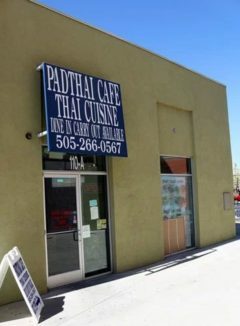 By meal’s end, there was near unanimous consensus that the Pad Thai Cafe is the Duke City’s very best Thai restaurant. This entry was posted in Larry's Top Ten, Thai, Vegeyarian. Bookmark the permalink.